At Google I/O 2018, Google announced that its digital assistant was getting upgraded with more natural-sounding speech in addition to six new alternate voices. Then, Google promptly scared the hell out of everyone by using the Google Assistant’s new skills to mimic a real voice so well, people on the other end of a phone call apparently didn’t know they were speaking to a robot. Now, just a few weeks after that demo, Microsoft has announced the purchase of Semantic Machines, an AI startup out of California that may help Microsoft upgrade Cortana’s abilities. While it’s hard to say if Google’s Duplex demo helped push Microsoft to close this deal, the news only reinforces the importance the tech world is placing on making digital assistant sound more lifelike. The goal of conversational AI is to support richer, more productive dialogues between humans and bots like Cortana, and by doubling down on AI, Microsoft is sending a message that despite being far behind Amazon and Google when it comes to the overall digital assistant market share, it isn’t giving up on the segment yet. Muddying the waters, today Acer announced the availability of the first Windows 10 laptops with Alexa pre-installed alongside Cortana. 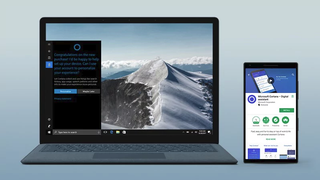 It’s a move that makes sense for buyers who might be more familiar with Amazon’s digital assistant, but it also threatens to de-value Cortana’s existence as part of the Windows experience. However, since Microsoft partnered with Amazon to more closely integrate the two company’s AIs back in 2017, building Alexa into Windows could be a win-win for both Microsoft and Amazon. Either way, the digital assistant wars are only heating up.